We can help you with your Mac Mini or iMac Fusion drive recovery..
Do you have an iMac or Mac Mini Fusion hard drive failing on you and you want the data back? Have other data recovery companies failed to recover data from your iMac or Mac Mini? We have NOW acquired the technology and expertise to successfully recover data from Mac Mini or iMac Fusion drives and can recover data with the CORRECT data structure with ALL folder structure intact..
iMac Fusion Drive recovery has been a big challenge for data recovery companies and there was no credible solution for a successful data recovery for the new iMac fusion drives used in Apple products made since 2013. This is because iMac Fusion Drive configuration uses 2 physical disks (typically one 128GB SSD combined with a normal magnetic/mechanical 1, 2 or 3 TB HDD) to appear as ONE disk space on the Apple machines. Fusion drive isn’t a caching scheme: data isn’t duplicated and shadowed. As for any RAID-0 or JBOD, when Fusion Drives come to us for data recovery, we need both the HDD and SSD to get a complete picture of your data because of their special configuration and inter-dependence. The SSD contains the entire MacOS, along with the frequently used program files and user data. It also contains most of the file system metadata. This does mean that without the SSD, the hard drive on its own, will not lead to a successful Fusion data recovery. This type of configuration is proprietary to Apple computers and they have not revealed the technology used in this particular data storage technology. In order to recover the data from an Apple Fusion Drive we as your data recovery service provider, will need both drives. If you just use the bigger mechanical disk without the corresponding SSD, the directory structure (and most larger data files that are not stored contiguously) will be lost and you will have a bunch of files and folders in a raw format the majority of which will be corrupt and unusable without any names or correct structure. Apple maintains that by using this technology, the access time will be much faster and much more efficient which may be true. However the problem is when one of these 2 combined disks fail, no data recovery company can figure out how to recover data successfully from iMac fusion drives and quite often they end up giving their customers corrupt data. This is because the Fusion drive technology has been a mystery for data recovery technicians for a very long time. After intensive research, in collaboration with Ace Labs, we have acquired the technology and capability to crack this Apple Fusion Drive mystery. 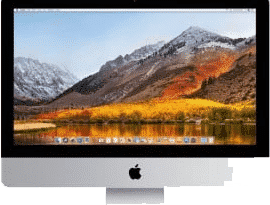 Data Recovery Lab is proud to announce that it is among one of the very few data recovery companies in the EU to be able to recover data successfully from iMac Fusion Drives. When you entrust your faulty iMac to us for data recovery, you can be sure that we will be able to deliver a successful data recovery from an Apple iMac Fusion Drive configuration. Therefore you will not end up having corrupt or unusable data by using other data recovery companies. You will see the results before you can pay. We can claim to be pioneers in the field of iMac Fusion Drive recovery. We look forward to ending the misery of all those who have had an iMac with a failed Fusion Drive and no data recovery company could actually have helped them. Problem solved. Just call 0207 516 1077 and speak to us. We surely can help you with your Mac Mini or iMac Fusion Drive recovery.